Few would argue that Alfred Hitchcock is the best director never to win an Academy Award. Why he never received the Oscar is beyond me, perhaps it was because he was British, or because he dealt almost exclusively in the much maligned suspense genre, or maybe it was because he had so much success in television. Regardless, one can’t argue with his importance to the motion picture business and if he was ever going to win an Oscar in my opinion it should have been for North by Northwest. 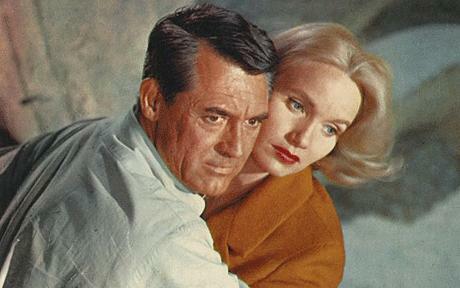 North by Northwest has it all — suspense, intrigue, great characters, witty and smart dialogue and that wonderful Hitchcock style. I may of course be biased since Cary Grant is one of my favorite actors, but he is superb in this film as an advertising man who is mistaken for a spy and ends up on the adventure of a lifetime. The Shakespearian plot even ends with a marriage as it were between the leading man and the leading lady, an absolutely stunning Eva Maria Saint. Hitchcock has given us so many iconic moments and there are two in this film — the scene in which Grant is being chased down by a crop duster and of course the climactic chase scene on the face of Mount Rushmore. Grant is ever so smooth even as a “bumbling” ad man who stumbles into danger. And of course he gets the girl, even though he’s 20 years her senior at the time of the shooting. Only in the movies would a 55 year old man marry a 35 year old woman (who oh by the way was playing a 20-something woman in the film). But I suppose he is quite debonair and it was the late 50s after all. Grant made four films with Hitchcock, including my favorite Hitchock film To Catch a Thief. All told Hitchcock made close to 60 films including some of the greats like Psycho, Vertigo, Rear Window, The Birds, Strangers on a Train, Dial M for Murder and so many more. Four of his films made the AFI Top 100 list including two in the top 15 in Vertigo and Psycho. He was nominated for a Best Director Oscar six times but he never won, although Rebecca won Best Picture in 1940 (yet didn’t make the AFI Top 100). What’s your favorite Hitchcock film? Ok, you’re on provisional approval again for admiring NBNw, but it’s gonna take some more good calls to make up for trashing American Graffiti and Nashville. Don’t blow this next one…it’s a biggie.